Resolver Systems today announces the release of version 1.3 of its groundbreaking program, Resolver One(tm) -- a Rapid Application Development tool for analysing and presenting business data, using a familiar spreadsheet interface. Resolver One integrates databases, code and IT-developed components to create powerful and easy-to-use solutions - all using your existing knowledge of spreadsheets. Version 1.3 introduces column- and row-level formulae, and has a built-in Web server so that people can share their spreadsheets. Today Resolver Systems announces the release of version 1.3 of Resolver One(tm) , a revolutionary improvement in spreadsheet software. "This version, with our new row- and column-level formulae, and its built-in webserver, really changes the game," said Giles Thomas, CTO and MD of Resolver Systems. Resolver One is a new kind of spreadsheet that gives you more control over how your models are calculated, by converting everything you enter into a computer program in the Python programming language and then making it easy for you to change and enhance that program. Since its release in January 2008, it has gained users in markets ranging from finance to oil exploration to pharmaceuticals. Column- and row-level formulae, using headers. 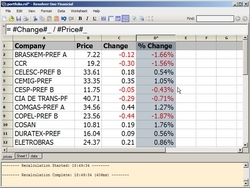 A user can can specify that one column is "quantity", another column is "price", and then specify a column-level formula for a third column to make it "quantity times price". The formula is in just one place, so as new rows are added to the spreadsheet, it applies to them automatically -- and it uses meaningful terms like "price" and "quantity" instead of cryptic cell references like "A4" and "D22". A built-in Web server. Users of Resolver One can specify that their spreadsheets should be shared over their intranet or the internet. An 14-day trial version of Resolver One can be downloaded from the Resolver Systems website, as can a free version for use in Open Source projects or for personal non-commercial use.